From time to time, every CFO or HR personnel has had to answer a perplexing question: What is the ROI here? Am I getting the best bang for the buck? There’s a lot Big Data can do: It can help organizations shore up their bottom lines by helping them review the performance of their departments, gauge the outcomes of their services, track loyalty of their customers and even help weed out non-performing human resources. Here’s a look at hard numbers on what it means for manufacturers, retailers and pretty much anyone who has a company to run. An early adopter of the technology, Germany’s Federal Labour Agency or ‘’BA’’ in short, is tasked with the finding jobs and providing support services for the unemployed. 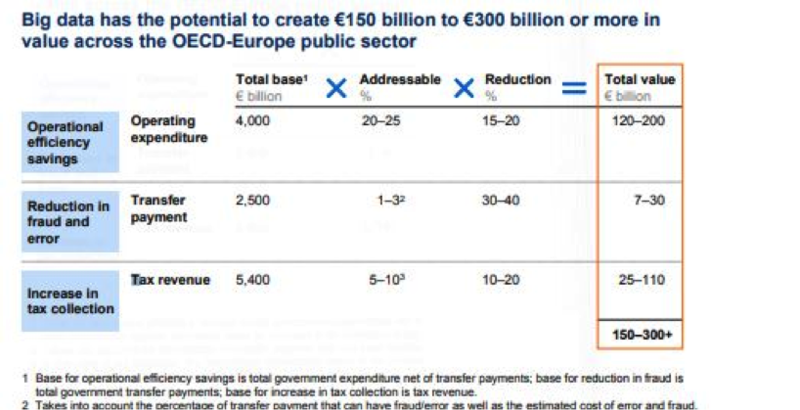 Armed with a €54 Bn budget and 1,00,000+ employees, it has cut more than €10Bn in costs by employing big data strategies by identifying and eliminating inefficient programs, creating new targeted programs and pitching them to segmented audiences and helping disseminate and adopt best practices. Surveys reveal that customers of BA highly appreciate the relevance and efficiency of their services. No matter the size or type of organisation, understanding where to direct your resources is crucial to profitability and the continued market-viability of any organisation. The above image illustrates the savings accrued in the form of increased tax collection, detection of fraud and increased operational efficiency by deploying Data Analytics. Such gains are achievable and relevant even for private businesses. Government’s, NGO’s and businesses can all build capabilities that allow them to deploy Data Analytics to make better sense of how their resources are utilised and how well they connect with their target audience. Data Analytics can successfully lead innovation in your company. Launching a new product or service always carries with it a high up-front cost in terms of time and money spent on recruitment, R&D, product development, marketing & publicity and other costs. Sometimes, with millions invested and the survival of the company at stake, here’s how some companies are using Big Data to get it right. Pramad Jandhyala, co-founder of LatentView, had this to say,’’ Earlier, a food company would go to panel of chefs or focus groups to see what product to launch. In that model, people didn’t tell you anything until you asked a question. 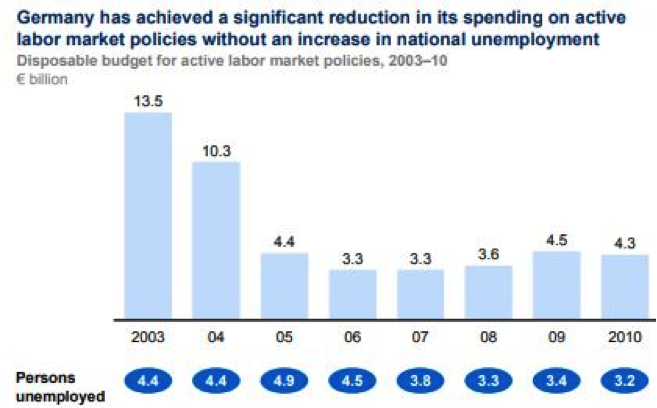 Now, you don’t ask any questions, only study trends. Tapping the power of social media and data analytics, her firm helped a client decide to start a restaurant in favour of flavours from Peru, Thailand, Korea and Nepal. She added,’’We listened in on social media conversations around which restaurants people ate at, their recommendations etc. Now companies want to see what they can learn from what people are saying rather than merely understand if they are saying good or bad things about a product’’. Understanding and capitalizing on trends is important to stay ahead of the game. Introducing the right product at a wrong time or marketing incorrectly to the wrong customer-set is a sure-shot way to burn cash. Lesson to learn? Simple: Your customers are leaving digital clues. Learn to read them. What do the experts have to say on this? Every single figure in the above image stands as a business opportunity for avenues of growth. 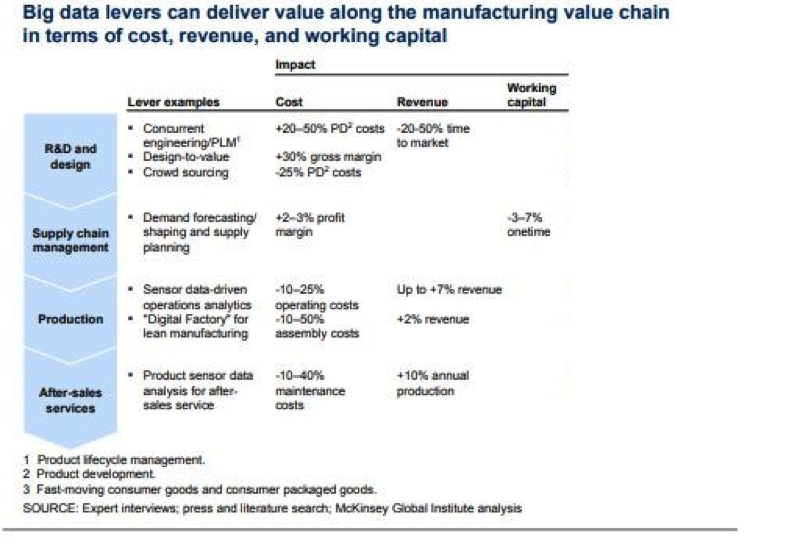 A Mckinsey Report explained, ‘’Big data can help manufacturers reduce product development time by 20 to 50 percent and eliminate defects prior to production through simulation and testing. Using real-time data, companies can also manage demand planning across extended enterprises and global supply chains, while reducing defects and rework within production plants’’. 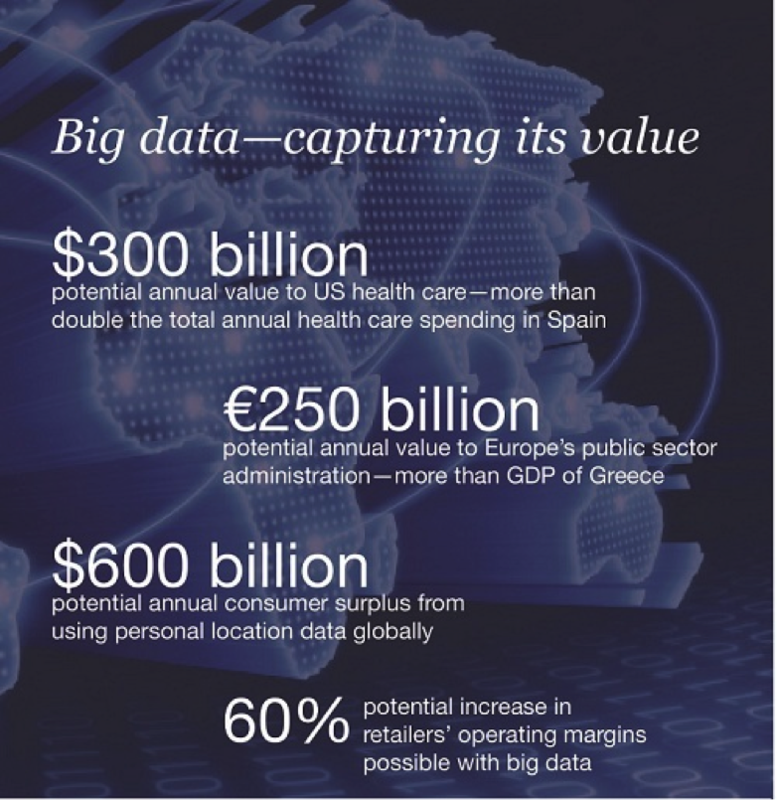 Notice, (in the above image), how costs can be slashed and revenues shoot up, regardless of where Big data is deployed in the value-chain. In sectors like retail, some retailers like Wal-Mart have developed the capacity to mine petabytes of data on customer preferences and buying behavior, giving them the leverage to win important pricing and distribution concessions from consumer product goods companies. The report went on to add that, ‘’Retailers across the industry are becoming more sophisticated in slicing and dicing big data they collect from multiple sales channels, catalogs, stores, and online interactions. The widespread use of increasingly granular customer data can enable retailers to improve the effectiveness of their marketing and merchandising’’. Did you know? Here are 3 real-life examples of increasing revenue using data mining. special offer on a sweater to the customer’s smartphone. The startup PlaceCast claims that more than 50 percent of its users have made a purchase as a result of such location-based ads. Nearly 50 percent of smartphone owners use or plan to use their phones for mobile shopping. housing values, and number of children. Targeted e-mails based on this information obtain ten to 18 times the response rate of e-mails that are not targeted, and the company is able to create different versions of its catalogs attuned to the behavior and preferences of different groups of customers. Use Data to your advantage! We help firms, of all sizes, unlock their potential by helping them adopt big data strategies.